Why don't all birds nest in bird houses or natural cavities? It seems like a good idea during the cold winters or rainy springs to have a cozy shelter. In reality many species of cavity-nesting birds have declined because of habitat reduction. In the eastern United States, where primeval forests are gone some birds like Eastern Bluebirds and Purple Martins depend almost entirely on man-made houses. Over 80 species of North American birds excavate nesting holes with their bill, use natural tree cavities, re-use holes created by other species or utilize bird houses. Chickadees, woodpeckers, bluebirds, wrens, nuthatches, and owls are just a few of the birds that use birdhouses to keep warm in the winter. 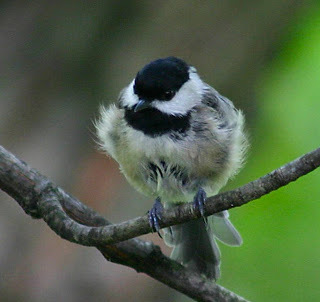 Other birds like cardinals, jays, doves, juncos and finches roost in dense brush or foliage. I have a lot of backyard birds that like to sleep in the pine trees near the feeding stations. As dusk approaches there is a feeding frenzy. The goldfinches at my house sometimes stay too long. I watch them feeding furiously and then see them look up and notice sun went down. Some find shelter quickly in nearby bushes while others have been known to spend the night on a feeder or if it's windy, huddled in a corner close to the house or even burrow into the snow. When the temperature drops below zero, sleeping birds need bellies full of high calorie foods to keep their little bodies warm right before bed and the first thing in the morning.